A Bucket or Pail is a vessel, usually cylindrical, open at the top, fitted with a semi-circular carrying handle. These buckets are put to many different uses. They are widely used in hospitals, nursing homes & other healthcare facilities for light duty applications including clinical & pharmaceutical waste. GPC Medical Limited, internationally reputed manufacturers & exporters of quality hospital equipment & devices, offer, in the range of stainless steel hospital hollowware, high quality Buckets also. Heavy duty, corrosion resistant, stainless steel goes into the production of our Buckets, the tapered shape of which allows the ease of pouring into as well as cleaning. Designed for use in medical facilities, they can be sterilized easily. Their workmanship and construction make them long lasting. In addition to our standard sizes/capacities, we undertake production of the Buckets - with or without cover - as per the customized requirements. 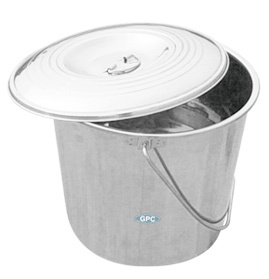 No wonder that the GPC Stainless Steel Buckets (Pails) are constantly in high demand in the international market. Send Your Buy Requirement For "Stainless Steel Bucket" AND Get Quote Quickly.